For around half a century, Maui music teacher Lance Jo empowered youngsters to succeed and his classes went beyond “black dots on a page” to include music history along with life lessons. Jo’s family, students and friends recently reminisced about the 80-year-old longtime Baldwin High School band teacher who died Feb. 23 after a stay of more than a month at Mercy San Juan Medical Center in Carmichael, Calif. The Kahului resident suffered a stroke. He was visiting one of his sons, Brent, in Sacramento, Calif., along with his only grandson, 4-month-old Jordan Kwan Hayami Jo. 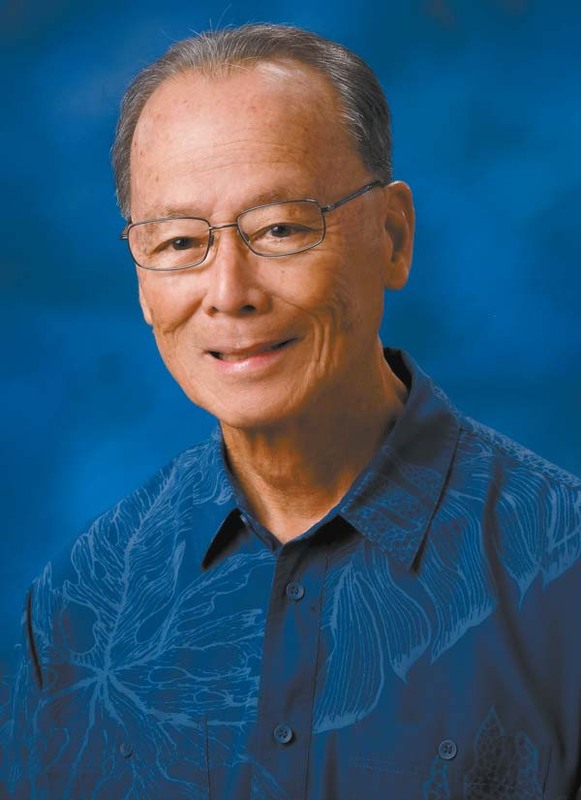 Services will be at 3 p.m. Sunday at Wailuku Hongwanji Mission with visitation beginning at 1 p.m.
“Mr. Jo was probably the most influential person in my life in Maui, the most supportive. . . . He made me feel like I could do anything,” said Kurt Muroki, a 1990 Baldwin High School graduate who attended the famous The Juilliard School in New York City and now is a professor at Indiana University. 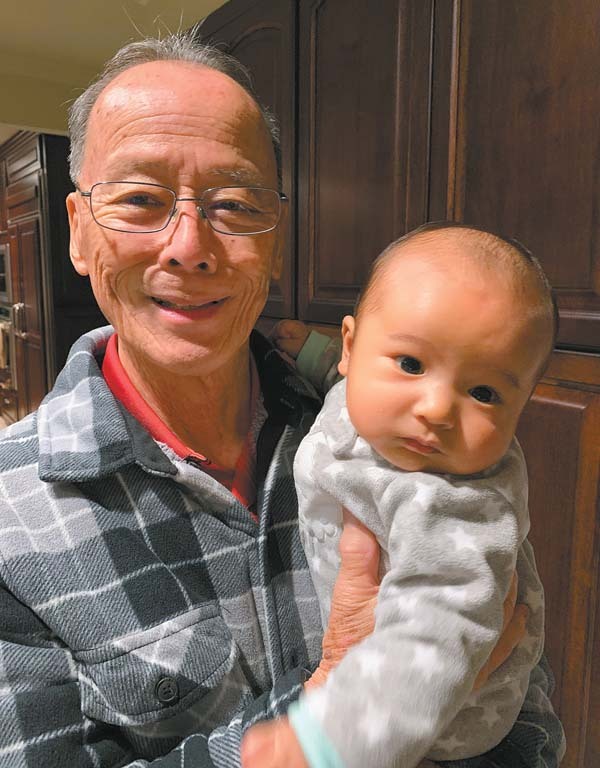 Former longtime Baldwin High School music teacher Lance Jo is shown with his grandson, Jordan Kwan Hayami Jo. The elder Jo died Feb. 23 in California. Jo’s longest teaching tenure was at Baldwin, which spanned from 1967 to 2003. He was responsible for the symphonic, concert, jazz and pep-marching bands. He also conducted the pit orchestra that provided live music for Baldwin’s Performing Arts Learning Center’s musicals. One of his highlights was taking the Baldwin High School Symphonic Band to Washington, D.C., in June 1995 to celebrate the 50th anniversary of the end of World War II. He also taught piano, classical guitar and guitar/ukulele classes and was a member and assistant conductor for the Maui Community Band. 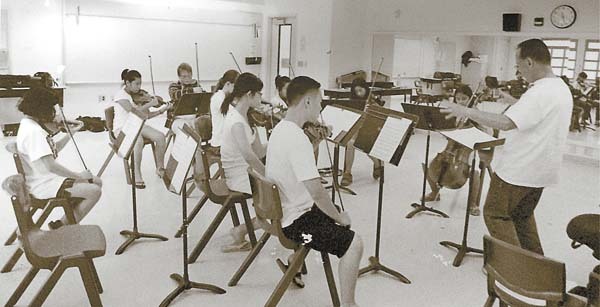 For 21 years, Jo had served as a clinician and conductor on the faculty of the Pacific Music Institute, a Hawaii Youth Symphony-sponsored summer institute on Oahu. He also was the music director of the Maui Youth Philharmonic Orchestra for 12 years until 2017. His daughter, Keli Wada, said that her father enjoyed having his students learn about music and succeed. “He liked seeing the kids learn to appreciate all kinds of music and to experience the feeling of accomplishment after a successful performance,” she said. Jo was born March 4, 1938, in Puunene and graduated from Baldwin in 1956. He then attended Indiana University and earned both a bachelor’s and master’s degree in Music Education. He was a member of the Indiana University Marching Hundred. Students who marched in the IU Marching Band for four years earn a wool blanket, a tradition which continues today. He also was a member of the Kappa Kappa Psi, an honorary band fraternity. He was in the U.S. Army and spent almost a year and a half in France. He was honorably discharged in March 1963 as a first lieutenant. He began teaching at old Maui High School in Hamakuapoko in 1964 and then transferred to Baldwin, where he spent nearly 40 years. Wada said she remembers her aunt Rumi Shoda, her father’s sister, saying that Jo always knew from he was young that music was his life and that music came easy for him. “I didn’t know that about him because he never talked about himself. Anyone who knows that piece knows that it is difficult on any instrument, let along the trumpet. He was an educator, performer, team player and he loved the students and they knew it,” she said. Among those who experienced that love was David Katsuda, now 48, who as a Baldwin student successfully auditioned to play with the McDonald’s All-American High School Bank back in the 1980s and performed in the Macy’s Thanksgiving Day Parade in New York City. Only two students from Hawaii were selected that year. Katsuda said the experience and confidence instilled in him by Jo helped him gain admission to the University of Washington. For the all-star band audition, Katsuda remembers practicing scales with Jo. But when Katsuda got a little flustered, he remembered Jo telling him that anyone who could be selected for the position would be able to play the scale. Katsuda said he translated that to something he should personally strive for in all aspects of his life, not only to meet band requirements. 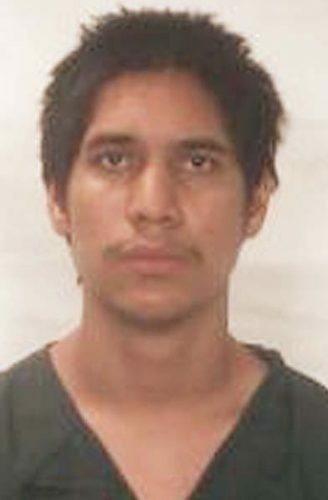 “That really stuck with me,” said Katsuda, whose family is also longtime friends with Jo’s family. As Jo helped Katsuda, he also helped Muroki, who remembers Jo encouraging him to audition for Juilliard. And later in Muroki’s career, Jo touted his alma mater, Indiana University, which led Muroki to take a position there. He is currently professor of double bass at the university’s Jacobs School of Music. Muroki, originally a violin player starting at age 6, said Jo told him there was no violin in the high school band, so instead he switched to playing the bass. But for the marching band, Jo asked Muroki to play the tuba. So Muroki had to take the position to be the “H” in the lineup for BHS. The two men kept in touch over the years. “I really think of him like a father figure, I really do. He was that for me,” Muroki said last week while working a late night at the university. Jo is survived by his wife, Donnie, another son, Kurt Jo, and four grandchildren.